The best dinners that $30 will buy you in the neighborhood. One of the most popular questions we get from people is where exactly our restaurant intel comes from. Well, aside from obviously paying close attention to openings, buzz, and various online resources, we listen to our friends. We’ve got a certain contingent of friends who swear by Dokebi, a Korean bar and restaurant in the warm heart of Williamsburg. You don’t hear much about Dokebi, but you should. It's a great spot to get some Korean food, and when you throw in the fact that it’s a really solid bar with good beers on tap and quality tunes on the playlist (Whitest Boy Alive, Talking Heads, Hot Chip, Fleetwood Mac) it's a perfect place to hang out. You come for three things: ridiculous Korean BBQ tacos, Bibimbap in a hot stone bowl, and the brunch that’ll take good care of your hangover, as it did mine this past weekend. First and foremost, we need to talk tacos. The favorite is the Short Rib Taco, with close runners up being the Spicy Pork and Giant Oyster Mushroom. OK, so this Bibimbap is absolutely incredible. I’ve been thinking about it ever since the first time we shared that special moment together, and can’t wait until the next time we do it all over again. Make sure you get it in the hot stone bowl, that’s key. Also, if you’re going with a meat, get beef instead of pork or chicken - way more flavor. The tofu is really good too. This is where the whole hangover curing, ridiculously comforting brunch kicks into full gear. Braised Berkshire pork belly set over a bed of Anson Mills’ organic grits with a sunny-side-up egg and country gravy served in a sizzling stone bowl. Sounds awful, right? Maybe if you hang with PETA. This dish will set you straight, we promise. Your standard veggie pancake. Definitely get it with kimchee. Solid, but nothing crazy. A very tasty noodle soup with thick rice noodles in a fish and veggie broth. This wouldn’t be our first choice here, but it’s definitely a good option on a cold day. 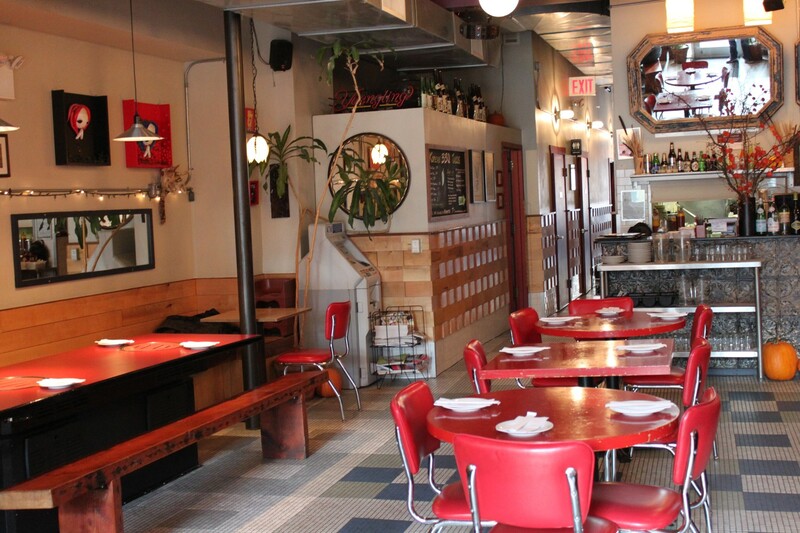 Birds of a Feather is a Chinese spot in Williamsburg that’s great for small groups. Stop by with some friends and share a few mouth-numbing things. Legendary thin crust pizza that you should make the trip to Coney Island for. You’re going to need an hour on the train to get to Tanoreen. But if you appreciate Middle Eastern or Mediterranean food, it’s more than worth it. One of our favorite restaurants in Brooklyn, especially in the summer when their back garden is in full swing. Bring some bug spray, eat a pork chop. Yes, Gaonnuri certainly has Eats with a View. It also has a wait staff straight out of WALL•E, all rocking high-tech earpieces and taking orders on iPads. We'll pass. Haenyeo is a walk-in-only spot in Park Slope with a fun atmosphere and some very good Korean food. Momofuku Ssäm Bar is a modern Korean East Village classic that has evolved with the times. Kunjip is a Koreatown favorite, Perfect For a quick meal before you head to Madison Square Garden. Party time fried chicken in Midtown that’s absurdly addicting and a fun place to eat food if you don’t take yourself too seriously. It seems like lately, all of the Korean food we’ve been eating has been of the “trendy re-interpretation” variety. While we’re fine with that, occasionally we get a craving for a more traditional meal, and for that, we head to Madangsui.